The 2014 EES Scholars have been and gone. The last, Dr Mohamed Gamal of the Egyptian Museum, Cairo, departed a week ago last Friday. My colleagues and I have now had a good amount of time to reflect on the programme – in what ways it has been a success and, crucially, how we can improve for next time. What follows is a much more expansive ‘think piece’ than I had originally planned. It includes a series of observations I have made about the scholars, but also the unsuccessful – but mostly very worthy – applicants, and by extension the wider field of young Egyptologists studying for higher degrees in the subject at Egyptian universities. I am not a specialist in higher education, but thanks in large part to the scholarships I have come to know the field perhaps better than most, and this experience has given me a lot to think about. I want to set my thoughts down so that I can show them to others who might know better and who might be able to improve my understanding of the situation. This is important because I sense that we have the opportunity to make a positive difference, and I hope that by offering my thoughts I might at least help move the discussions forward. There are no doubts others who have had similar experiences and who may have contrasting views, or who might conclude that mine are somewhat naive, but I’ve not yet across very many others who have made their thoughts and if nothing else this is meant to be a way of starting the conversation. 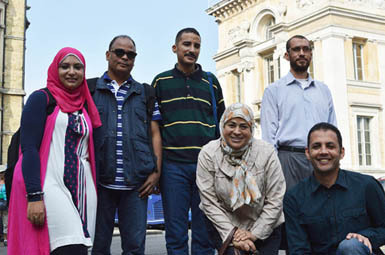 In September, six of the brightest, young Egyptian archaeologists, Egyptologists and Museum curators visited London to take advantage of the Society’s extensive library and unrivalled archive for their research, and to visit colleagues and institutions throughout the UK. 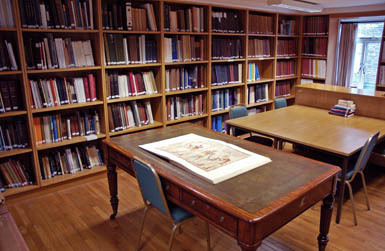 From the outset, the basis of the offer was quite straightforward: we were very aware that we had resources available in London, particularly our world-class Egyptology library, which were not at all times stretched to the limit, while at the same time there are many in Egypt working with ancient sites and monuments on a daily basis who have no access to any such facilities at all. Simple. We have certainly succeeded in helping the scholars by providing access to such resources, but the programme has been beneficial in far more ways than this alone. The expression of intent was well-received from the outset. I first mentioned wanting to bring “more Egyptians to the UK, to contribute to and/or to benefit from our own education programme and from visits to other Egyptological institutions" in a blog post written a few weeks after I became Director, in March 2012. The idea of ‘scholarships’ was put to the membership as a project we would like to undertake should sufficient funds be forthcoming in late 2013 (see here) but only really became a reality in Spring 2014 when the British Council, Egypt agreed to support the idea by providing the funds to bring first three scholars the UK. The Council subsequently offered to extend its support to allow us to increase the number to six. The announcement of the competition for places was warmly received as a clear sign of our intention to maximise the impact and usefulness of the Society’s work in Egypt. The Society’s Cairo Rep, Essam Nagy, outside the EES Office within the British Council buildings in Cairo where the interviews took place. The Council provided the necessary financial support for the scholarships. The response to the announcement was overwhelming: we received approximately 100 applications for the six places. Going through them took a long time but it was an enormously interesting and useful process. I realised straight away that this was a golden opportunity to get to know some of the brightest young heritage professionals in Egypt: to know what they were working on, what their aspirations were, and what challenges they faced in trying to reach their goals. We interviewed nineteen, and whittling that number down to six was very difficult indeed. The candidates we selected all brought excellent research projects and had clear ideas about how they would use their time in London, but also how the scholarships would be of benefit to them in their work after they returned to Egypt. One of the most interesting aspects of the process to me was that the vast majority of applicants were postgraduate students, affiliated to one of the half dozen or so universities that offer Egyptology tuition at that level, but were also, at the same time, working within the Ministry of Antiquities (MSA) either as antiquities inspectors attached to particular sites in Egypt, within the central administration in Cairo, or as curators in the major museums. Although we have a longstanding and very good working relationship with the MSA and have only recently begun to develop relations with the universities, principally Cairo and Faiyum Universities so far, I had thought that it would be a good thing to extend the scholarships to university students as well as MSA employees, who would normally be our priority. I hadn’t realised that this would make little difference as most grad students were MSA employees anyway. Many had been working for the MSA for some years in fact. It is not the case in Egypt that you finish your studies before starting your career in the profession, as is usually the situation in the UK and elsewhere, where these days most who are able to find work within the subject have obtained a doctorate before beginning the process of applying for jobs, for many of which a degree at that level is a minimum requirement. It will come as a surprise to some therefore, just how many Egyptian professionals are already in gainful employment in the field in Egypt apparently far earlier in the process of gaining qualifications than their British counterparts. The academic vs the practical part I: a competitive advantage missed? It should be borne in mind, that most of these MSA jobs do not require the same skills that are developed through graduate research in Egyptology, but more practical skills, in heritage management, field archaeological techniques, or object handling etc. (as is also the case with most Egyptology jobs elsewhere – Egyptological research is rarely more than one part of most Egyptologists’ jobs). It was nonetheless very interesting to see that in many cases the applicants’ research did not relate directly to their day-to-day work at the Ministry. Despite the distinction between academic research and practical skills as outlined above, it seems a missed opportunity that more students are not connecting their research with their day jobs, given how many are already working with ancient material at first hand, even while studying at Master’s degrees level. 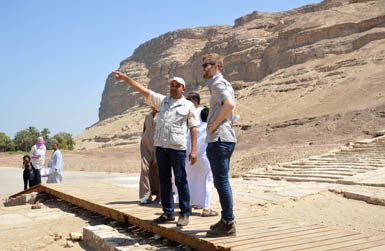 In fact, despite all the challenges faced by Egyptian research students by comparison with their counterparts from elsewhere in the world, the one obvious advantage the Egyptians might, in theory, have over everyone else is in the access they have to primary material and the unique opportunity to study sites and monuments in situ. And yet, as the scholarships have shown, many are undertaking essentially library-based research, and are heavily dependent on published material, much of which is simply unavailable to them in Egypt. This, of course, is one of the things that has given us the opportunity to help. But we can only do so much: the are many more promising young Egyptologists with jobs to go to – vital jobs on the frontline of Egyptology, caring for the sites and monuments – than we can accommodate on the programme, and even for those we can bring to the UK, one month, massively helpful though it is, is not the same as having access to those libraries etc for years on end as students in the UK do. I wonder if Egypt could make more of the competitive advantage it should have in being able to offer its students such unrivalled access to the sites and monuments. 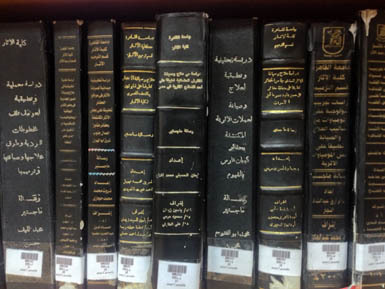 Rather than having its students try to compete with the rest of the world’s by pursuing library based research, in which they are at a considerable disadvantage, dissertations should be more closely focussed on the primary material they have to hand in a way that no student outside Egypt could ever have. This would be doubly beneficial of course given the likely impact on one of the Society’s main priorities: from the EES point of view particularly, but also more generally perhaps, it seems to me that helping to preserve and document primary material, particularly that which is still in situ as this is the material that is perhaps most vulnerable, should be a higher priority than reinterpreting material that has already been documented and/or is kept in the relative safety of museum collections. The ultimate aim for the scholarships and other initiatives like it which have the aim of helping with the development of young Egyptian professionals, collectively, should be to ensure that Egypt’s sites and monuments are looked after by the best people in the world. Nobody really wants to admit to this but achieving that immediately would mean the Ministry employing an awful lot more foreigners than it does at present, as in general, Egyptologists, archaeologists, museum curators, heritage managers etc are better trained elsewhere than in Egypt. But for other reasons it would not be appropriate or practical for the Ministry not to be staffed, at least in the main, by Egyptians. 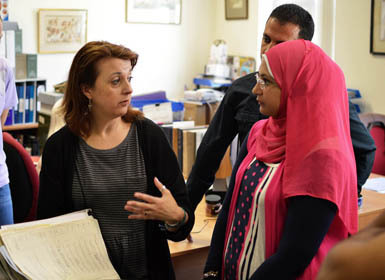 Our aim is to help redress the balance for our Egyptian colleagues by providing them with opportunities, training and exposure to the best practices and specialists we have to offer in the UK. Ideally, our Egyptian colleagues should be able to compete with their foreign counterparts for jobs anywhere in the world, and one might even expect them to have an advantage over their colleagues from elsewhere given their exposure to the primary material as argued above. One important point of note here is that for most foreign Egyptologists the discipline is thoroughly international. We all are required to read books and articles written in languages that are to some extent foreign to us. We all travel, to Egypt of course, but also to other countries, for conferences, to study in other institutions or to examine particular objects, and, for many, to find employment. 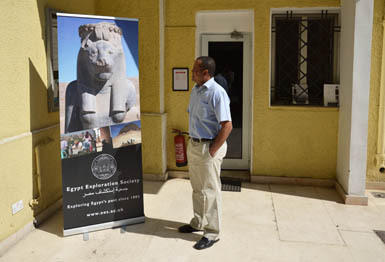 Most job opportunities in the subject around the world will attract an international field of applicants, and as a result many professionally employed Egyptologists work in countries other than the ones they were born in. This seems to be much less the case for our Egyptian colleagues. Travel is much harder for economic reasons, and access to the international literature is limited. A body of literature in Arabic has developed instead, and the two are mutually exclusive, which cannot be healthy – the ‘gene pool’ for Egyptology would be much stronger if the two were combined. My knowledge of the literature in Arabic is next to non-existent but I suspect this isolated, separate strand of the subject is probably, dare I say it, not on a par with the international literature. And many Egyptologists in Egypt are trained using this alone as it is so much more accessible both in terms of the books and the language within Egypt. Our Egyptian colleagues need to join the international community in a way that they do not at present if this balance is to be redressed. So what’s my point here? Well, firstly, the international community has the opportunity – and therefore the responsibility – to help by providing opportunities, and I’m pleased that we have made a small contribution to this through the scholarships. Another obvious challenge faced by the applicants was that, as they were working full-time at the same time as studying – and many also had families to look after – they had very little time left to get on with their academic work. With the result that many take years longer to complete their higher degrees than would normally be the case elsewhere. It was interesting to note that many used the word ‘registered’ to describe their status as students, as if they were students on paper, but in reality had not time to do any studying at all. In fact, several applicants admitted openly that one of the benefits of getting a scholarship would be that it would allow them time away from their work to concentrate on their studies. Could the Ministry perhaps find some funds to allow even just a select group of its most promising employees paid leave to complete their dissertations, perhaps in partnership with overseas institutions which might assist financially and/or in the provision of library and other resources? I don’t have the solution to this of course, but the greater the awareness of the issue the more chance there is of finding that solution. Although I had originally thought we would be awarding scholarships to those with the best research projects, most of the applicants brought both research projects and entirely distinct day to day responsibilities with them, and it therefore became clear by the time we had finished the interviews that we would have the opportunity to help in other ways as well. In fact, in the end, having six places to offer gave us the opportunity to reward candidates on varying bases: some simply has excellent research proposals, in line with our original intention; others were among the few whose research dovetailed very nicely with their day to day work; in other cases, we wanted to reward candidates working in key roles within the Ministry, connected with, for example, the current problem of the illicit excavation and trade in antiquities. Our experience with the successful applicants over the last few weeks has helped develop our ideas on this too. My colleagues, Essam Nagy in Cairo, and Carl Graves and Hazel Gray in London took on the organisation of the scholars’ stay in London. Hazel, in particular, organised a very busy programme of visits to Museums around the country, mostly to see their Egyptian collections and to talk to colleagues. What was interesting about this was that the more museological aspects of what they saw – the arrangement and display of the objects, interpretation, signage, visitor facilities etc. – were as useful and interesting to the group as the Egyptology. Previously I would perhaps have tended to think of what the EES has to offer in more narrowly Egyptological terms; we do not do heritage management, museum studies etc. That is the job of other organisations like English Heritage or The National Trust, at least in this country, but perhaps we should see our role more in those terms where our activities in Egypt are concerned. Egyptological research is only one aspect of what is needed in Egypt and probably not the most urgent by any means, and we are already beginning to think about how we can build more than just research into our expeditions to Egypt, most of which have been doing much more than this on their own initiative and/or with prompting from the Ministry, but we will be doing this in a more coordinated way in future. And in terms of how we can assist our colleagues, we might not think that heritage management is really our thing, but if we don’t provide this kind of assistance, who will? 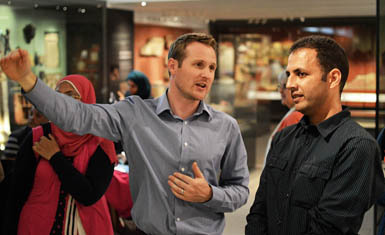 The British Museum’s International Training Programme provides assistance on the museums front, but we have the opportunity to act as a gateway between our Egyptian colleagues and heritage professionals of all kinds in this country. Our scholars’ visits to non-Egyptological sites such as Stonehenge and the city of York, and a very productive meeting with one of Trustees, Susan Daniels, who works for English Heritage, has shown how useful we could be in this way. So what next? I very much hope that funding will allow us to repeat, or expand, the programme and in the basics in fact there is not a great deal that I would change. The first group would have preferred a longer stay; the many excursions and meetings we arranged were very well received but it left the group with less time than they would have liked to get on with their research in our library and archives. We would like to extend the duration of the stay from one month to six weeks next time, and will aim to tailor the programme more closely to each candidate’s needs so that each visits only those people and places that are most useful to them, and they do not all feel obliged to join every excursion. I think we also have an opportunity to help provide some non-subject specialist skills of the kind that are taken for granted among student in the UK, and which would allow potential future scholars to maximise the benefits of a visit to London. 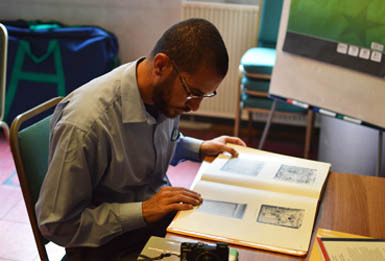 To this end the next round of Amelia Edwards Projects – a diverse group of innovative, small-scale, new initiatives we put to our members each year – will include a project to send one or more experienced Egyptologist researchers to Egypt. They will be based in the Society’s Cairo Office for three months, to contribute to the Society’s programme of lectures and classes, and to assist our Cairo staff member in the development of other educational activities, particularly the provision of training in writing applications, preparing and delivering oral presentations, making the most of library and archive resources with the use of research tools such as the Online Egyptological Bibliography, the Topographical Bibliography (‘Porter and Moss’), Who Was Who in Egyptology and so on, and writing up their research for publication. 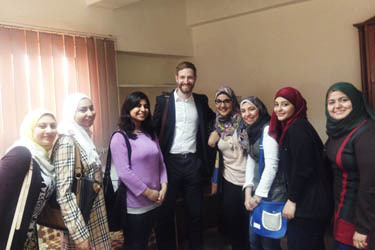 It is enormously gratifying that something which began as an idea a couple of years ago quickly attracted the support – from an organisation with as much reach and influence in Egypt as the British Council – we needed to put it into action, and that it has been such a success. It’s just as exciting to think about what it might lead to next, and that in making the most of our resources and contacts to assist in the development of those on the frontline of Egyptian Archaeology, at the sites, monuments, museums and storerooms of Egypt, we may only be at the very beginning. 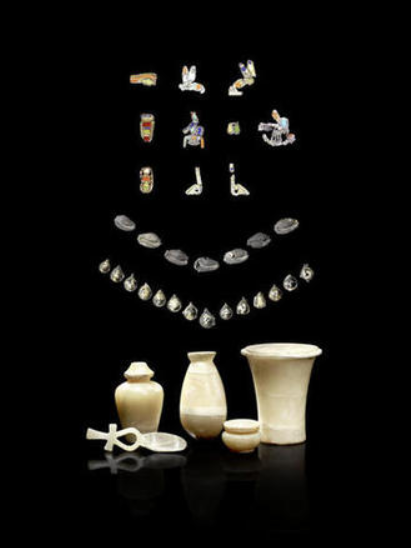 The ‘success’ of such illicit activity, as defined by the amount of money to be made from the sale of the objects excavated, encourages the proliferation of similar activity elsewhere in Egypt, exacerbating all the above problems. Furthermore, although not directly related to the Society’s aims, it is worth noting that such activities also deprive Egypt of the opportunity to benefit from objects which are a part of its heritage. 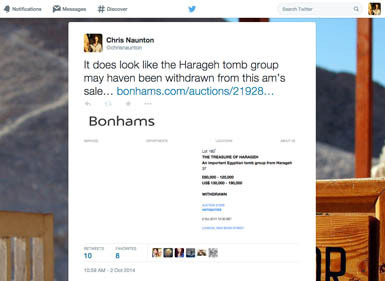 Encourage the proliferation of similar sales and, potentially, illicit excavations, to generate further profits. 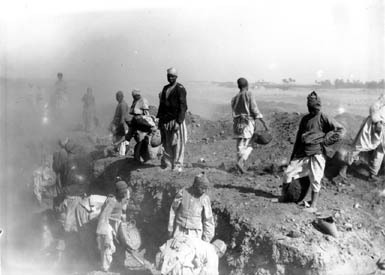 The Society has conducted excavations, surveys and other archaeological work in Egypt under license from the Egyptian authorities from 1883 to present. 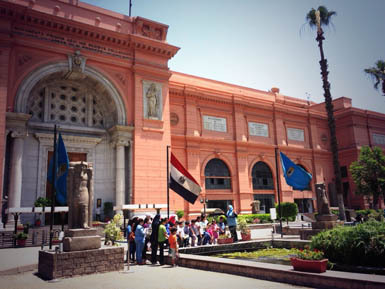 Many thousands of objects (‘portable antiquities’) were uncovered during the course of this work and transferred for their safety and preservation to secure locations, usually the Egyptian Museum, now situated on Tahrir Square in Cairo. Under the ‘partage’ system the Society, and other excavating institutions, were, until the 1980s when the system was stopped, regularly allowed to retain a portion of the objects removed during the course of its excavations, at the discretion of the antiquities service. 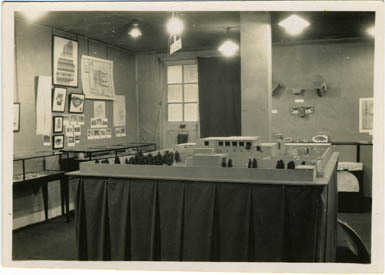 These objects were transferred to London and exhibited to the public as a record of the Society’s work during the year. The intention here is clear, I think. Recently a group of objects, a ‘tomb group’ excavated by Flinders Petrie at the site of Harageh, near to the Faiyum Oasis in Egypt, was put up for sale at auction by Bonhams of London. The objects had been in the collection of the St Louis branch of the American Institute of Archaeology (AIA) to which Petrie had sent them in exchange for a financial contribution towards his ongoing excavations. (It is important to note that the St Louis branch is distinct and separate from the national AIA – see further, below). 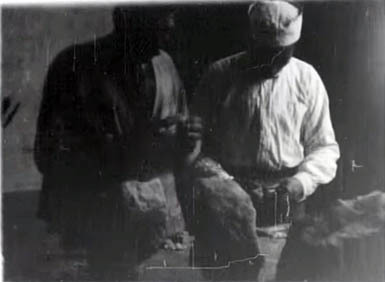 Although Petrie was not working for the EES at this point but under the auspices of his own organisation, the British School of Archaeology in Egypt (BSAE), this was typical of the way both institutions worked. Clearly, the offering of these objects for sale went against Petrie’s intention that they should remain in a public collection, and against what the Society and other organisations like it is trying to achieve today. Public collections offer the best hope that ancient objects are safeguarded against loss or deterioration to their condition, and that they will remain accessible to scholars and the wider public for study and enjoyment. Objects which are sold on the open market may be transferred to collections which are not required to provide such safeguards, and which have no obligations to make the material they contain accessible. Shortly after learning of the sale (and with little time left to lose before it took place) it was agreed that a statement objecting to the sale should be issued in the name of the EES and the UCL Petrie Museum of Egyptian Archaeology, as the successor organisation to the BSAE. Our two institutions were founded and run along very similar lines, and the system of partage was in fact established following discussions between Petrie, then working for the EES, and Gaston Maspero of the Egyptian antiquities service (see Drower, ’Gaston Maspero and the Birth of the Egypt Exploration Fund’ JEA 68 (1982)). Most importantly, many thousands of objects excavated by the BSAE and EES were distributed to public collections in the UK, USA and elsewhere and remain in those collections today. Much stands to be lost if further material of this kind is offered for sale. It was not only the case of the Harageh objects that was of concern therefore, but the potential for further such sales in future. My colleagues and I felt it was crucially important to adopt a clear and robust stance against the sale, and to make clear the grounds for our objection. In other words, for once we wanted not to take it for granted that everyone would know why it was bad that these objects were being sold, but to spell out as clearly as we could why that was. We hoped that our names (personally and institutional) would give the message some clout, and did what we could to ensure that the message was circulated as widely as possible, succeeding in getting it picked up by the mainstream media (in e.g. Medavia and The Daily Telegraph – see above image). We considered raising the possibility there may also be legal grounds for objecting to the sale but as the situation from this angle was unclear we felt it better to focus on the ethical case; we also chose not to mention any of the other high profile cases when Egyptian objects have come up for sale, such as the auction of the Northampton statue of Sekhemka (see the excellent piece by Mike Pitts, here), which involved similar but not identical issues. On the morning of the sale, the objects were withdrawn. We later learnt that negotiations, unbeknownst to us, had been underway in the States, to arrange for the objects to be sold to the Metropolitan Museum of Art. This was a good outcome in that they will remain in a public collection, of the very highest order in this case. It was not all good however. It led to very positive statements being released by both Bonhams and the St Louis AIA (quotes here) celebrating the role they had played in bringing this about. However, it seems very unlikely that this would have been the outcome were it not for the actions of others, principally the negotiators in the US. And let’s be clear, both had other reasons to celebrate: both must have made considerable amounts of money from the sale of these objects to the Met. And worse, there was a second lot, a headrest which had also come from Petrie’s excavations at Harageh, which was sold at auction and has now disappeared from view – the worst case scenario. The St Louis AIA did not respond to our petitions, nor to those of the central AIA which has also now issued a statement expressing its “grave concern” at the sale. The statements from St Louis and Bonhams ignored all of this and in fact suggested that there was nothing wrong with the sale after all, perhaps to clear the way for further sales in future. This is very dangerous; our aim was to stop the sale on ethical grounds, partly for the sake of these particular objects but moreover to create a precedent that would deter any other organisation in a similar position to the St Louis AIA from disposing of their objects in the same way. The triumphalism of the St Louis and Bonhams statements may, on the contrary, encourage further sales. Such sales encourage others to act in the same way, and, worst of all, encourage illicit, criminal activity – looting – in ‘source’ countries such as Egypt. Several of those involved in the campaign in the UK are continuing to investigate the legal situation to try to establish whether or not organisations like the St Louis AIA which received objects from the EES and/or BSAE have the legal right to sell those objects. The regulations of both suggest not, but it is not yet clear whether these have any legal force. There is a frustrating lack of documentation, not a single example of a signed contract relating to the transfer of ownership to the receiving institution for example, to help clarify things. There are many positives to take from this case however. It is a significant step forward for the Society that we have given such consideration to the issues which we have always been aware of but only perhaps in general terms, and adopted such a clear and robust position. We have a momentum now, and will be better equipped if and when another similar sale occurs. I hope we have helped raise awareness of the issues as well (this post is also intended to play a part in that) and the reasons why sales such as this are problematic. It has also thrown into focus how fragile and impermanent our own actions can be. As Egyptology has reached sufficient age that it has gained its own history, the archaeologists of the past come to be seen as historical figures themselves, actors in an ongoing narrative. It is now clear that the distribution of objects, such an important past of the EES’ legacy, may also be much less permanent, and more vulnerable and transient than those who found the objects might have hoped. Objects of incalculable value for the story of humanity were lost until they were dug up by Petrie and his successors so that the whole world could come to know them again. We have them back, he might have thought, and we won’t lose them again. Or will we? That is exactly what is at stake here. How much better off are we when objects that have been recovered from the sands simply disappear again into anonymous, untraceable collections? The truth is that the cavalier manner – this is how it seems to us now – in which the distribution of objects was handled – the lack of documentation is sadly, characteristic of the way a great deal was and handled in the past – has meant that that the EES and BSAE gave away, at that point, any control they might have had as to what happened to the objects. Fortunately, the vast majority of the objects concerned went to institutions that have endured and operate according to similar principles, and have remained in those collections. We are aware of exceptions however, going back to the middle of the 20th century at least, and there may be other cases we are unaware of. 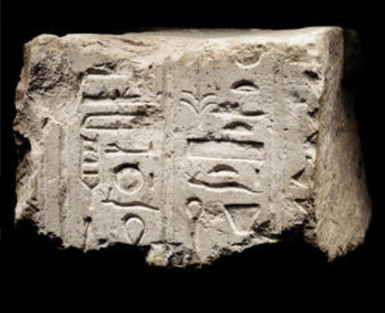 In fact it came to my attention while we were working on the Harageh case that a relief fragment excavated by the Society at Amarna had previously been sold by the St Louis AIA in the 1970s. 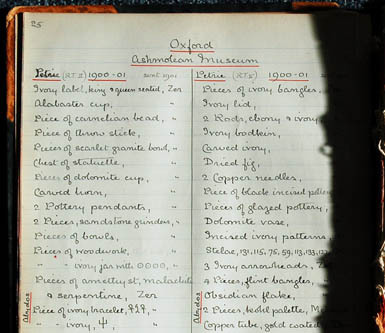 We have no effective means of keeping a track of all the objects distributed by the EES over the years, although Dr Stevenson’s new project, ’Artefacts of Excavation’ may retrospectively provide us with a picture. So this isn’t a new issue but our recent efforts are nonetheless vital, as the problem seems to be getting worse. Looting in Egypt has undoubtedly increased since the revolution of January 2011, and is exemplified by the horrors witnessed at El Hibeh and described by Prof Carol Redmount in the most recent issue of Egyptian Archaeology. 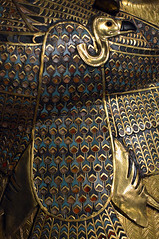 We cannot know what has been lost as a result – this is part of the problem – but it is a safe bet that material has been sold onto the market as a result; much will have entered private collections entirely under the radar of Egyptologists and the authorities; in a few cases such material has appeared more publicly and been returned to Egypt (see e.g. 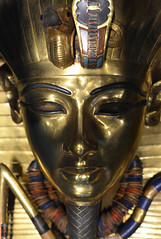 ‘A collection of ancient Egyptian artefacts recovered from London’). The Repatriation Department at the Ministry of Antiquities has been successful enough in this to stage an exhibition of recovered pieces in the Egyptian Museum, Cairo recently. Two papyri in that exhibition were excavated by the EES at Saqqara in the early 1970s and stolen from a storage facility no later than 1996 at which time they entered a private collection. That they were no longer at Saqqara where they should have been was spotted by Demotist, Cary Martin while he was working on the texts for publication. With his assistance, and the full cooperation of the owner, Martin Schøyen, the Society arranged for them to be returned to Egypt via the Egyptian Embassy in London. * The papyri will be published in the next volume of the Journal of Egyptian Archaeology later this year (H S Smith, Cary J Martin and Sue Davies, “The Horhotep Letters’ from The Sacred Animal Necropolis at North Saqqara’ JEA 100 (2014), forthcoming). In the last few weeks alone several further cases have come to my attention. I was contacted by a friend in the Abydos inspectorate pointing out that a head of Ramesses II, part of a group statue, and still in place on the king’s shoulders, in situ in the small temple of that king in the early 1980s, was currently on sale in London. 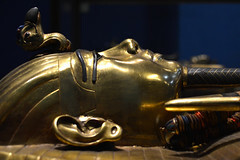 Another statue excavated by a project connected to the EES in 2011, and presented at a conference in London in September, was subsequently revealed to be on sale in Brussels. This apparent rash of cases may be coincidence but we cannot afford to take that chance. *I am grateful to 2014 EES Scholar Reham Zaky for confirming that the papyri in the exhibition were those from Saqqara. UPDATE 30 Oct 2014: I presented some of the thoughts in this post at the conference, ’To publish or not to publish? A multidisciplinary approach to the politics, ethics and economics of ancient artefacts’ on 25 October 2014. The slides from my presentation are here.